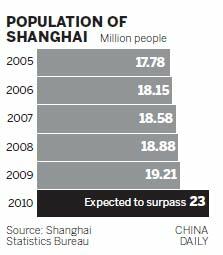 SHANGHAI - This city's population might have reached 23 million, far exceeding the earlier estimates of 20 million, a demographer said on Tuesday. Experts encouraged Shanghai authorities to take more steps to manage the local population and to undertake scientific urban planning in response to a quick rise in the city's migrant population. Shanghai has an officially registered population of 14 million but, according to estimates, is also home to 9 million migrants, said Ding Jinhong, director of East China Normal University's School of Social Development. Ding, who is also the director of the university's population research institute, said the estimate was based on the most recent national census, which began in November. The official results will be announced in April. Of the migrants included in the census estimate, about 2 million were only in Shanghai for a short stay, many coming for medical treatment or for travel. That left about 7 million who lived in the city for more than six months, he said. During the past decade, the city's population density has risen from 2,588 people for each square kilometer in 2000 to 3,600 for each square kilometer in 2010, according to previous media reports. Wang Zhixiong, head of the local statistics bureau, said Shanghai witnessed much faster population growth than did Beijing, another densely populated city. Experts said Shanghai should make population management a top priority, or else risk losing its capacity for steady development. Ren Yuan, professor of Fudan University's School of Social Development and Public Policy, encouraged the government to devise ways to manage mass concentrations of people in big cities like Shanghai. "The influx of migrants made a great contribution to the city's development," he said. "But it also challenged the city's limited resources and space." "The continual growing population overloads the city's public services. Housing, education, health and other public services will face even more pressure." Ren stressed that the current system for registering households, in which permanent residence permits called hukou are issued, was an obstacle to the city's development. In many cases, he said, it prevented migrants from enjoying the benefits of the city's public services. The government should adjust the hukou system and try to find rational ways to provide more quality services to migrants, he said.